In Memory of Jaime & the 16 other victims from the Parkland shooting. 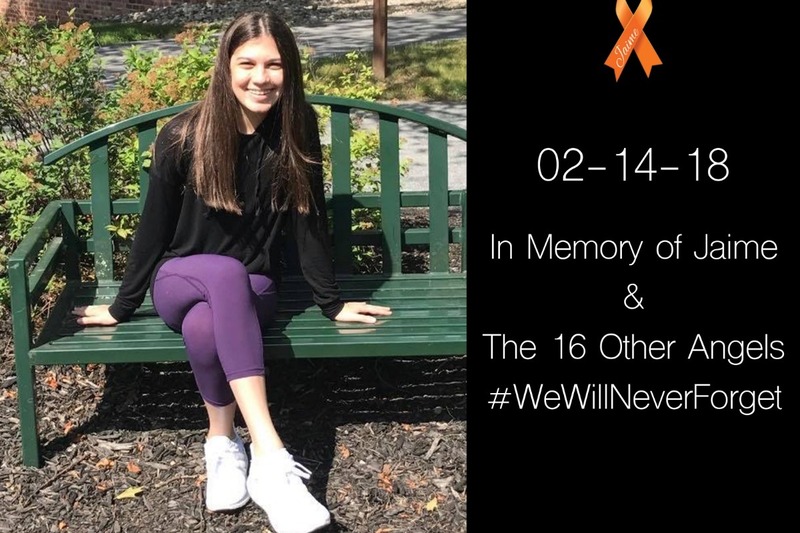 It’s hard to believe that it has been one year since we lost our daughter Jaime to the senseless and heart breaking murder at Marjory Stoneman Douglas High School in Parkland, Florida. Since that time, we have been laser focused on raising awareness/ funds for the causes important to Jaime and to putting our energy towards making sure that a tragedy such as Parkland never happens again. In reflecting back on this past year, I have been extremely busy traveling the country speaking on topics such as public safety while trying to inspire and lead towards change. Out of our grief, we had no choice. Three of the organizations that we selected to contribute our time and financial support to are: The Humane Society of Broward County, Jacob's Pillow, and The Paley Institute. You can learn more about these organization on our website. We were also involved in many local, regional and national events to create awareness, heal communities and raise money for causes that are consistent with our mission. Such events included Unite2gether Parkland, an amazing event with strong community involvement that proved to be healing to Parkland. In addition, we launched the Orange Wave Dad’s Challenge to encourage dads across the country and world to do something creative and show support for common sense gun safety. In 2018, I also worked with Mayor Michael Bloomberg as a keynote speaker at an inspiring event in Parkland to demand change during the midterm election. I also attended and spoke at the Influence Summit in Washington, DC that explored the influences that build and sustain current social movements. In addition, I was one of the guest speakers to discuss community activism for pursuing common sense gun safety. I also attended the Kavanaugh confirmation hearings in Washington, DC as a guest of Senator Dianne Feinstein and recently attended the State of the Union address as a guest of House Speaker Nancy Pelosi. In between I travelled the Nation making appearances and giving speeches for public safety, common sense gun laws and other topics that support the Orange Ribbons for Jaime Foundation (ORFJ). Valentine's Day will always take on a different meaning in our lives and in the lives of the other 16 families that have been affected by this national tragedy. As we continue our mission in 2019 and beyond, please help us with our efforts and donate a minimum of $17 in Jaime’s memory as well as the memory of the other 16 victims tragically lost on February 14, 2018. Our daughter was Jaime Guttenberg. Her older brother was Jesse. She was murdered in Parkland Florida on February 14, 2018. She was a beautiful, kind and intelligent teenage girl. She danced with tremendous grace, had an amazing smile, and loved to laugh. She was supposed to have her whole life ahead of her but it was cut short. We are all devastated. We have create a 501(C)(3) foundation called Orange Ribbons for Jaime. The purpose of our organization will be to support causes important to Jaime in life, but also causes that will deal with why her life was cut short. We will look to make donations in the world of dance, and to organizations that deal with bullying and children with special needs. However, we will also support organizations that deal with the causes of violence in schools and other public facilities and on how to limit casualties associated with the violence. A little background behind the name Orange Ribbons. Jaime's favorite color was orange. Her dance studio friends who loved her very much decided to honor her memory by wearing orange ribbons. Because of Jaime's love of dance and the dance worlds love of Jaime, the orange ribbon spread through dance studios around the nation and the world and through Broadway. About 2 weeks after Jaime was murdered, we learned that orange also happens to be the universal color of the gun safety movement. With that, our hope is to make the Orange Ribbon the symbol of the gun safety movement. My hope is that all people who care about public safety from guns will help me to do this. Thank you for all the love and support. Please help spread the word. May Jaime’s memory be a blessing. On behalf of Fred Jen and Jesse, thank you to everyone for all of your love, your comments, and your very generous support. There will be an attempt to try and answer everyone more personally — but we know you all understand that this may take some time. We are reading your messages. Please know it’s only through the goodness of humanity that we are deriving strength. All of us together, in Jaime’s memory, will make change happen. Please continue to share her page. Fred is hard at work creating an organization that will use these funds to help protect our kids. Thank you for your continued support. Please continue to share this page. Fred and Jen will be taking control of this site. Please be patient as they attempt to respond to all of your incredible generosity and kindness and all your beautiful notes. This has been an unimaginably difficult time for all of us, and especially for them. It will take some time to absorb all that has happened and all that needs to be done. They will continue to post updates as Orange Ribbons for Jaime evolves. It has been 14 days. Fred and Jen want to thank everyone for their generous support of Orange Ribbons for Jaime. Eventually they will send more personal notes of gratitude for your beautiful notes and your kindness. In the coming weeks and months we hope to provide updates on how the funds will be spent. Please keep sharing Jaime’s gofundme Page.